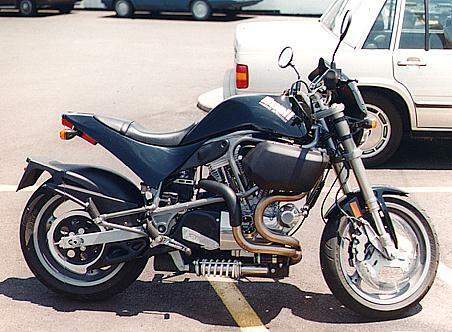 Shown here is a Buell (finally, a Harley powered cycle but in a design other than the typical cruiser). I am glad they got around to competing against the current superbike craze. I'd prefer that they use a more modern power plant, say one with liquid-cooling. But for the time being, it'll do. 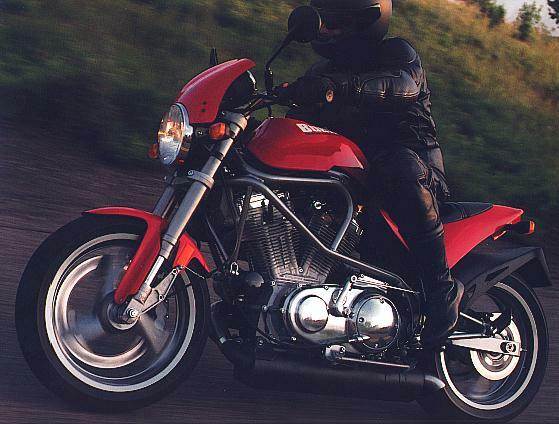 Notice how the Buell unintentionally mimicks some basic designs of the Hawk GT. 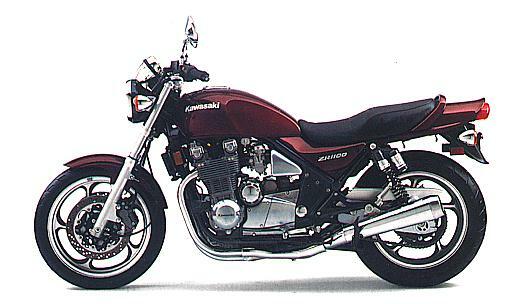 As if that weren't enough, here is a Suzuki GS500E. So, which came first....the chicken or the egg? 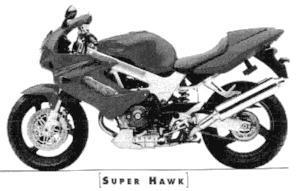 The newest bike of Honda's to carry the Hawk nameplate is the Super Hawk. They are both excellent, modern-day predators of the current superbike craze. As much as I cheer for Ducs in GP races, except for my deep devotion to the ever powerful Kawi, I think it's time for Ducati to feel pressure for the first time in it's career. Ducs have dominated the V-twin end of superbikes for quite some time. I love twins and these bikes soothe my soul. 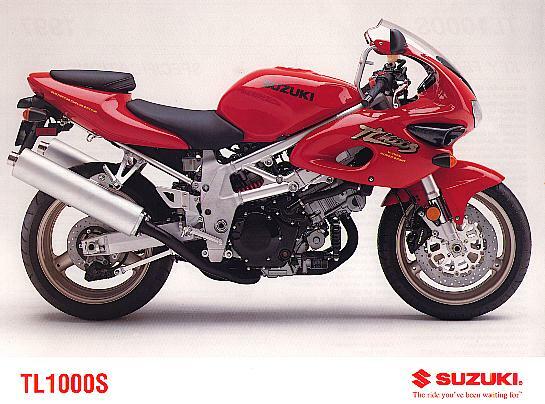 Personally, although I'm for Honda, I'll vote the Suzuki TL as having the best appearance. 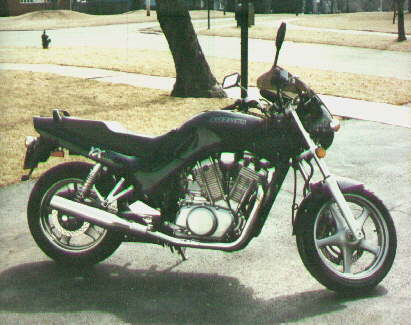 The '98 model proves to be unique just the same but with an optional full fairing. 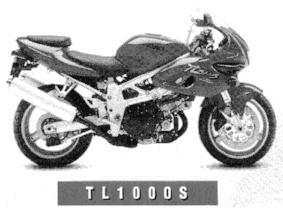 I've only met a TL1000S on the road. Very intimidating. Just to add in comment while on the subject of superbikes, I am in awe over the new YZF-R1. Personally, I like the blue paint scheme the best. Sorry Honda, I like your products but I like keeping an open mind also. 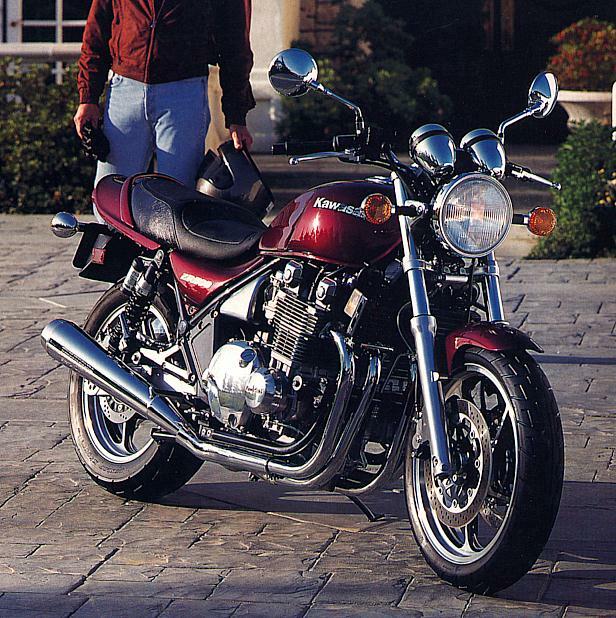 1993 Kawasaki ZR1100: 8valve, twin plug ignition, 534 lbs dry, Luminous Vintage Red (deep burgundy color) This was a very limited production bike. I think '93 was the last year (and maybe only year) it was sold. 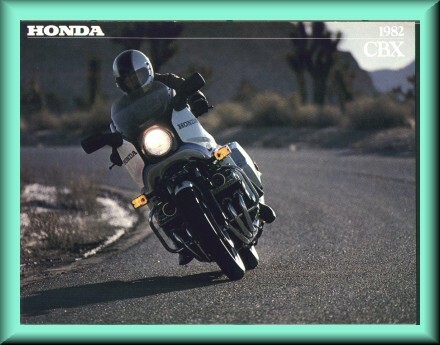 Honda tried something similar with the CB1100 a few years back. The ZR1100 is my favorite in style, color, and Kawi's heritage of producing a wicked bike. 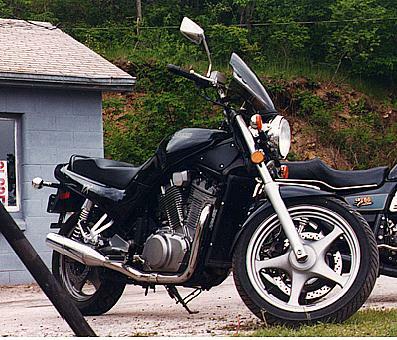 The ZX-11 is a perfect example. 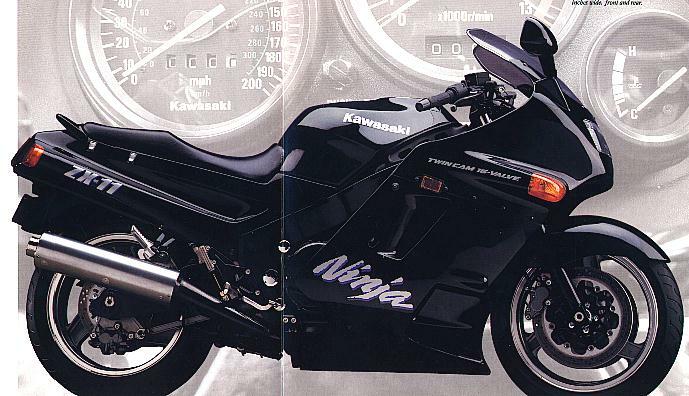 I particularly like the '92 model (shown) because Kawasaki painted the frame black. For the succeeding years, the frame was painted silver/aluminum. To me, it did something to it's formidable look. It now looks no different than a typical 600~1100cc superbike. 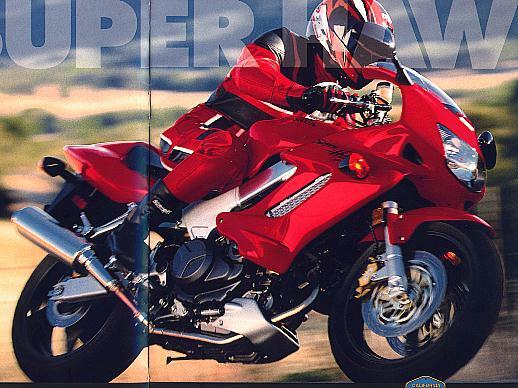 Some say the new Super Blackbird by Honda is king, but some vote for the ZX-11 to reign. 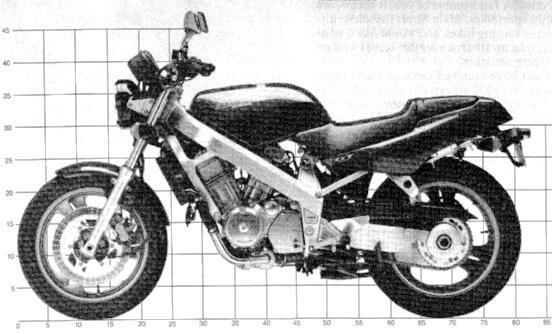 I'll wait for the ZX-12 and more statistics. Honda can produce a more well rounded bike but Kawasaki has my vote for pure horsepower-to-pavement on flat out acceleration and top speed. 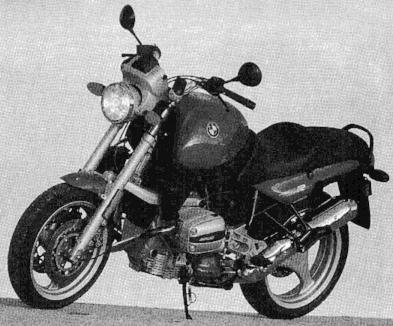 This is a BMW R1100RS. They also made a dual-purpose version but almost looked to ficticious with its looks. I prefer the street version. The newest models to the BMW line are quite earth-shattering in their designs. Can't give a comment on those since I haven't gotten up to speed with the new BMWs. That is a bike you could ride all day long! It didn't feel like 700+ pounds until trying to maneuver slowly in a parking lot. Then, you actually had to keep the bike upright with the handlebars. The six was very peculiar sounding--like nothing I ever heard before. Something crossed between a four and a triple--the rooo, rooo of a triple but very tight like a four. 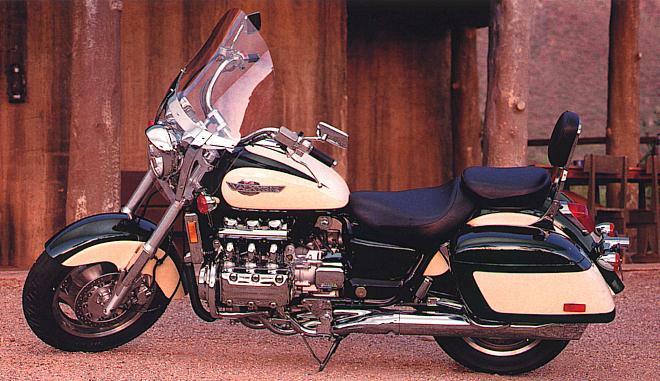 Probabaly very similar to a CBX though. Ahhhh, a nice Honda collectable. Need I say more? Here is a photo of the touring version. 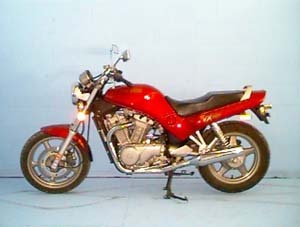 Here is a Suzuki VX800. 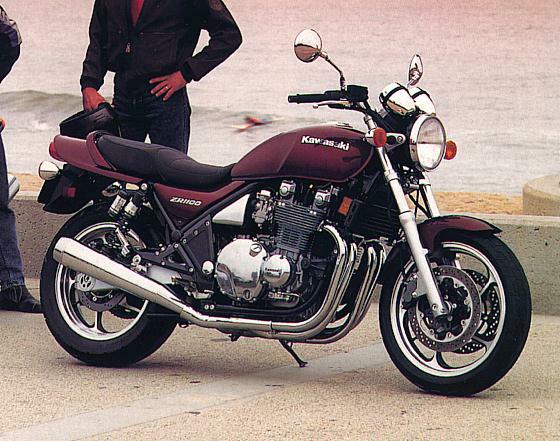 Very similar to the Ascot, shaft drive, liquid-cooled, but with a modern design like the Hawk GT. Again, the issue of it not being sporty enough for my tastes. 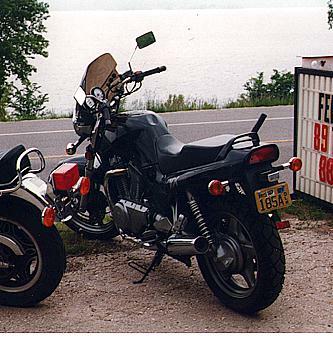 It is hard for me to believe that a 'larger' 800cc engine could offer me as much fun on the backroads like the Ascot or Hawk can. However, I do bet it is a better tourer than the Ascot for long trips! This is a Kenny Roberts Special, Yamaha RZ350. 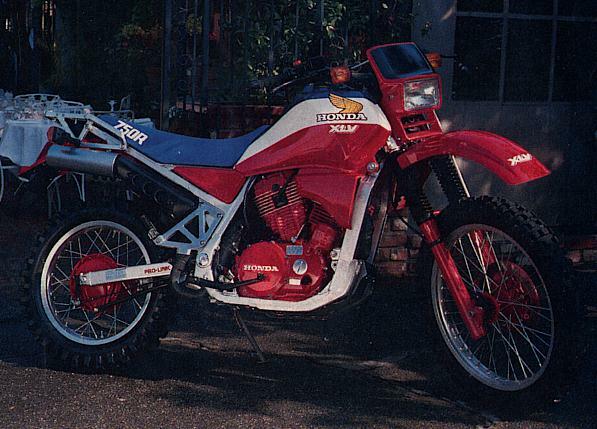 It is a two cylinder, two-stroke, liquid-cooled replica of Kenny's racer. 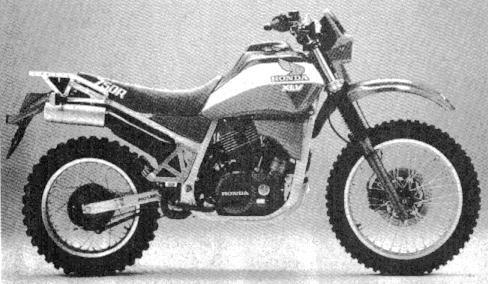 Notice the triple disc brakes and the monoshock. 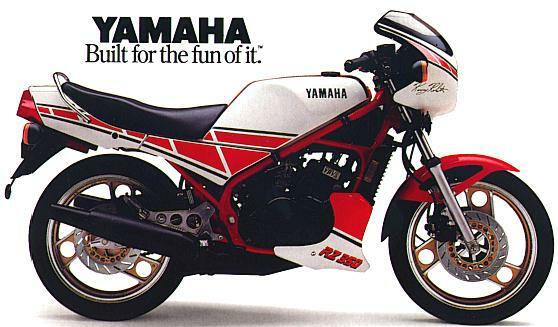 I'm not sure how many years Yamaha marketed this model, but I believe it was offered in '84 and perhaps '85. 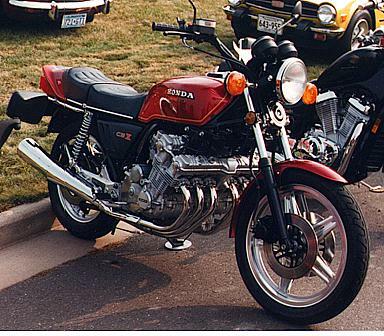 This engine featured the YPVS (Yamaha's Power Valve System). 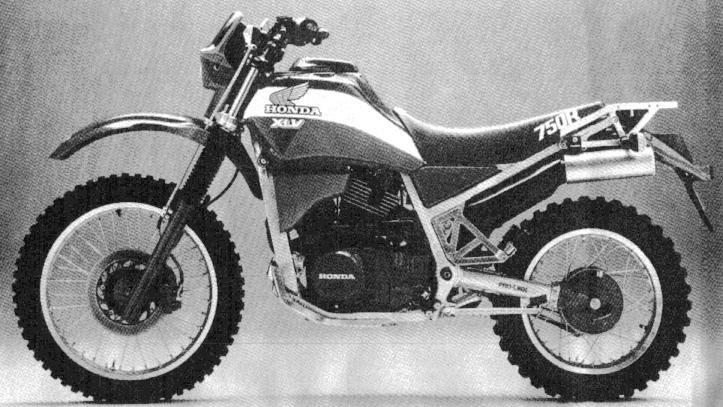 This uses a microprocessor to vary the exhaust port openings according to engine rpm which makes for a very useful WIDE powerband, not typical in two-strokes. Here is a bike you may never see. This is a European marketed version only. 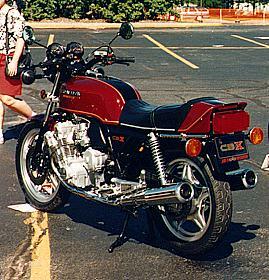 A Honda XLV 750 on/off bike. Same powerplant as the Shadow 750, but with oil cooling instead of the otherwise known liquid cooling. This was no cycle for the whimpy. 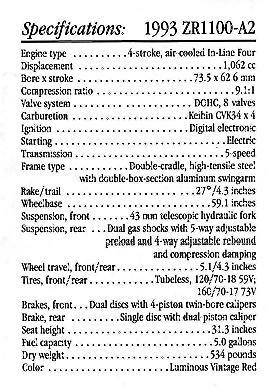 Imagine this... a baja bike weighing in at 461.5 lbs (dry) with a 5 gallon tank containing 33 lbs of fuel for a total weight of 494.5 lbs. WOW, that's all I can say. 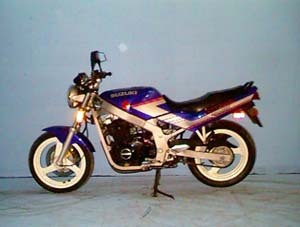 One last motorcycle I LOVE and OWN is an early 90's Royal R/C motorcycle, 1/5 scale. I purchased it as a Hyper kit, no radio, unpainted but built for a 540 class motor. Here is a picture of it after a painstaking paint job by hand, still some detail to go. 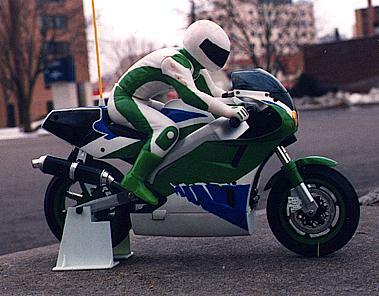 The scheme is of a 1993 ZX-7R but the chassis more resembles a 1992 (what can I do?). Support for the Royal motorcycle is non-existent and no parts/upgrades are avaliable. I'm in the process of fitting it with ball bearings, and as I can locate it, another cycle for fun or parts. If anyone has one of these or are researching resources, feel free to write. I'd like to re-establish support for this novel bike. I'm told the 1/8 Kyosho is trouble-prone and who can afford the NEW Nitro version from Europe? Click HERE for a link page.